Installing outdoor landscape lighting may seem to be a daunting task for many homeowners, however the benefits outdoor lighting provides makes the challenge worthwhile. When done right, landscape lighting makes the best of what you have by highlighting architectural features and drawing attention to otherwise over-looked details. 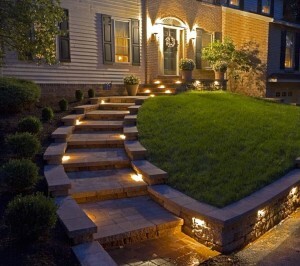 Outdoor lighting adds a new dimension of beauty, safety, security and usability to your yard. Using properly placed lights can highlight and enhance the unique features of your home, allowing details of your home to stand out and become more beautiful. Outdoor landscape lighting is a surefire way for your home to give a stunning first impression to visitors and passersby. The right outdoor lighting can do wonders for the curb appeal and perceived value of your property. 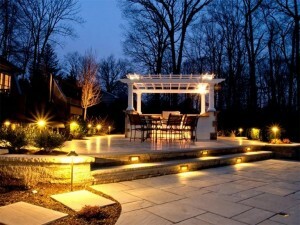 Outdoor landscape lighting will not only provide monetary, visual, and functional benefits. It will also provide added safety and security for your outdoor area. Well-designed outdoor landscape lighting will prevent falls caused by poor visibility. Light steps, hills, or other un-even grounds from the side or below to ensure shadows don’t obscure vision, but will instead provide extra visibility. The additional visibility provided by outdoor landscape lighting will promote an accident-free, safe environment after sunset. A well-lit area is a secure area. 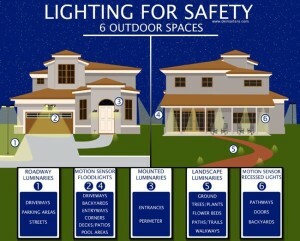 Outdoor landscape lighting will discourage home invasions and trespassing. Installing motion-sensor lights will further deter potential intruders by increasing their chances of being caught. You’ve put the time, energy and money into making your property look its best, so why let that hard word disappear after the sun goes down? Only using your outdoor area during daylight hours means reducing the return on your investment. You can enjoyably extend the time spent outdoors when you have ambient lighting to welcome you in from the darkness.